1. Preheat large skillet over medium heat with 1 tablespoon olive oil. Add onions, garlic, red pepper flakes, cumin, salt and pepper. Cook, stirring occasionally, for 3 minutes. 2. While onions are cooking, preheat a medium nonstick skillet over medium-high heat with remaining tablespoon olive oil. In a shallow dish, combine juice of 1 lime, honey, chili powder, salt and pepper. Add salmon fillets to lime-honey mixture and toss to coat thoroughly. Add seasoned salmon to the hot skillet and cook until just cooked through, about 5 to 7 minutes on each side. Cover for quicker cooking. 3. To the cooked onions, add bell peppers and corn kernels and cook for 1 minute. Add chicken broth and continue to cook for another 2 minutes. Add the black beans and cook until the beans are just heated through. Remove the skillet from the heat and add the juice of the second lime, the cilantro and the spinach. Toss to wilt the spinach and then taste and adjust seasoning. 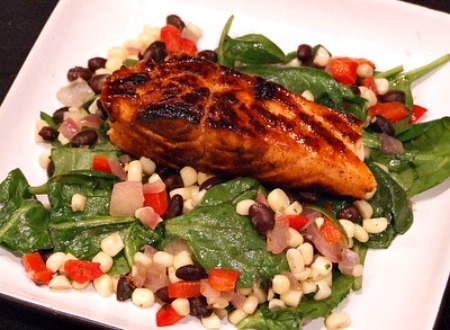 Serve the lime-and-honey glazed salmon on top of the warm black bean and corn salad. *If you don't have access to fresh corn, use a 10-ounce box of frozen corn. 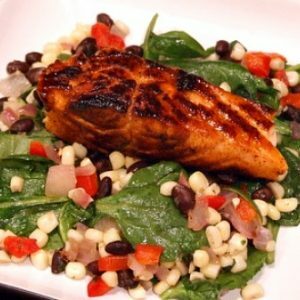 *If you are preparing this recipe as Gluten-Free, just be sure to use brands of chicken broth and black beans that are known to be GF.